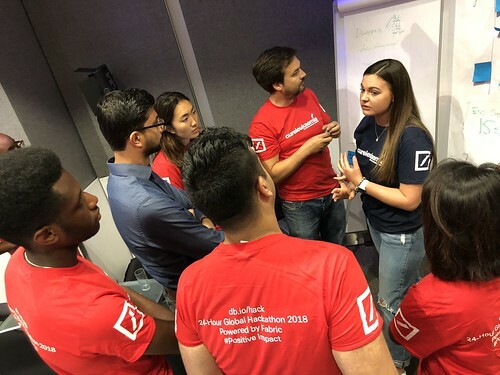 A record number of Deutsche Bank volunteers across the globe took part in a 24-hour Hackathon event to design prototypes for a mobile app to benefit blood cancer patients worldwide. The technological expertise of 800 of the bank’s staff was offered to one of its UK Charities of the Year, Cure Leukaemia, and the volunteers located in London, Hong Kong, Singapore, India, Romania, Germany, Russia and the United States worked through the night to create a range of prototypes for the charity. All of these designs will now provide the foundations for Cure Leukaemia to build on to make the app a reality. ‘She Hacks!’ an all-female winning team based in London, developed a prototype called Sanguine, derived from the Latin for blood - and also a term for being positive. Using a friendly interface and clever programming, the app suggests “buddies” with similar diagnoses, age and gender. It also curates articles from trusted sources and keeps track of a patient’s wellbeing and key statistics. Patients can choose to share this information with friends, family, buddies or doctors, as well as fetch blood test results and report their daily progress. “It was a lot of fun to pull together across a diverse range of technical perspectives and seniorities to produce a prototype solution that focussed on the needs of leukaemia patients, their families and carers. We all worked on something new in terms of technologies or platforms, splitting our responsibilities across design, user interface, backend, release and even automated testing. “It was a huge privilege to be involved in this truly global event that has the potential to change the lives of blood cancer patients worldwide. The wealth of talent and innovation that was displayed by the volunteers during those 24 hours was clear to see and we now have a huge number of ideas to draw upon to make this app a reality. “This was an event we will never forget and further emphasises how transformational our partnership with Deutsche Bank will be. “I know only too well how much it means to have someone to talk to and all the mountains of lengthy but useful information you are given. A panel of judges from across the bank evaluated the prototypes based on four categories. A winning team from each country was shortlisted and a winner chosen in each category. Aside from winning the admiration of their colleagues, the winning teams will get to see their ideas, designs and code used to help produce the final design and resulting app. The event was promoted and shared widely on social media with hundreds of tweets and LinkedIn, Facebook and Instagram posts, including celebrity endorsements, from Gary Lineker, Ian Wright and Matt Le Tissier from the world of football and even film star Mark Hamill. England football manager Gareth Southgate also showed his support prior to the event. More information about the winning application, how the Hackathon was put together and the technology behind it will follow over the coming weeks.